Happy Friday! This week has been a flurry of activity on the home and work fronts. My days lately are filled with interviews and other launch excitement as we gear up for Oh She Glows Every Day to hit the shelves in a few short weeks. (Exciting side note: I just heard the book will launch a few days early in Canada, on Saturday, September 3rd!) I’m trying to channel any anxiety I have into excitement (a great tip I heard years ago), which I admit can be challenging with all these hormones floating through my system, hah. On the blog and app side of things, I’ve been preparing content for when after baby arrives, to make sure there are some exciting recipes planned during one of my favourite cooking/baking months (October!! Who else is excited?). The prospect of fall is also helping me get through this intense heat wave we’ve been going through, and I can’t wait to cool off in our friends’ pool tomorrow. PS—Stay tuned for Monday’s blog post, where I’ll be sharing my game plan for Make-Ahead Freezer-Friendly recipes. I’m excited. Q1. Hi Angela! What’s the difference between soy sauce and tamari, do you know? Or is there a difference at all? A. Hi Sue, Great question! Soy sauce and tamari sauce are both made from fermented soybeans and are quite similar in colour and flavour, so it can be easy to assume they’re basically one and the same. Yet there are actually a few differences between the two. First, traditional soy sauce contains significant amounts of wheat, while tamari—a specific type of Japanese soy sauce made as a byproduct of miso paste—is made with little to no wheat. (If you’re eating gluten-free, you should always check brand labels to be safe!) Additionally, tamari has a darker colour, richer flavour, and slightly thicker consistency than soy sauce; you may also find it tastes a bit “smoother” and less salty. My go-to is low-sodium organic tamari. If you’re looking for a soy-free option with a similar flavour, coconut aminos is great, too! Q2. I just tried making your Classic Green Monster in my Vitamix for the first time and I’m not sure what I did wrong, but it came out frothy and it wasn’t cold. I even threw a couple more ice cubes in to see if that would help. My banana was frozen and my almond milk was refrigerated. Any ideas why the smoothie didn’t turn out cold? A. Hi Katie, Oh, warm smoothies in the summer are not my cup of tea either! I’m not quite sure what went wrong with yours, but sometimes blending for too long in the Vitamix will actually heat up the smoothie. So, my advice would be to be extra careful not to over-blend it, or to try adding more ice. Q3. Hi Angela. 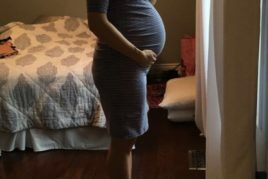 I recently started taking the Baby and Me prenatal from MegaFood. It’s a great vitamin but the iron in it is extremely constipating for me as I’m already prone to constipation. Do you have any tips? A. That’s never a fun situation, Megan! It may be a good idea to speak with your doctor at your next appointment to see if they have any suggestions about a prenatal vitamin that might agree with you better. But, in the meantime, I do have a few tips that’ll hopefully help you out. I’ve found that it really helps to up my water intake; when it comes to slow-as-molasses digestion, dehydration can be a sneaky, but powerful, culprit. 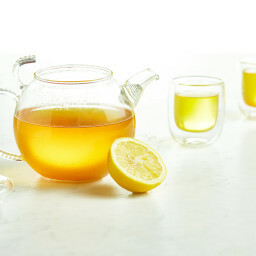 Hot beverages, like tea, coffee, or simply hot water with a bit of lemon, are commonly recommended. I make a habit of drinking several cups of liquid at the start of each day. 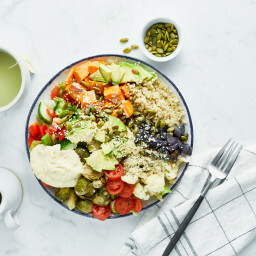 You can also try adding more fibre to your diet—but be careful not to add too much too quickly, because that can exacerbate symptoms like gas, bloating, and cramping. Great sources of fibre include bran, oatmeal, beans and legumes, and fruits and vegetables. Fruits and veg noted for being particularly high in fibre and great for constipation relief are prunes, figs, apricots, berries (I didn’t realize the power of berries until my toddler started going through a big berry phase, haha! ), broccoli, plums, pears, and apples; listen to your body, though…no two people’s digestive systems are the same. Flaxseed can also be a great thing to add into your diet. 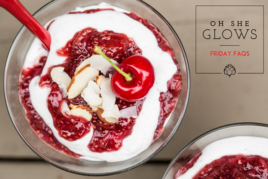 If you need recipe inspiration, you could try making my Happy Digestion Smoothie, Feel Good Hearty Granola Bars, Almost Instant Chocolate Chia Pudding (chia is another excellent source of fibre, but make sure to consume a lot of water with it! ), Vegan Overnight Oats (top with some of the fruits I listed! 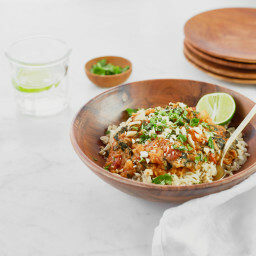 ), or a veggie bowl filled with fibre-rich veggies and bulked up with beans and/or lentils. And, of course, there’s exercise! Getting your body moving may help to get your digestive system chugging along, too. I hope this helps, Megan! Q4. Hi Angela, I’m a big fan of yours…your recipes always inspire me! I bought your cookbook last summer and it got me out of a major cooking slump and I already have OSG 2 on pre-order! I can’t wait!!! Quick question: What other sweetener would you recommend to use in your Glo Bars? I’ve had a hard time finding brown rice syrup and I’ve used maple syrup but it doesn’t seem to hold them together as well. Thanks! A. Hi Hillary, Thanks so much for your lovely words, and for your support of my cookbooks! I hope you enjoy the new book when it arrives in a few weeks. To be honest, I haven’t managed to find anything that works as well as brown rice syrup at holding the Glo Bars together. Something about its viscosity and general “stickiness” is really hard to find in any other sweetener. I’ve tested Glo Bar recipes with maple syrup myself (as well as every other liquid sweetener I could get my hands on…agave, honey, malt syrup, coconut nectar, etc.) but never had much success with anything else. But I’ve got to say, the various attempts—though crumbly—were still pretty delicious. (Smoothie topping, anyone?) I’m not sure where you’re located, but you can find brown rice syrup via online retailers, such as Amazon (with free shipping if you are a Prime member). Q5. Hi Angela, My granola burnt after less than 15 minutes at 300℉. Is there something I missed or could be doing wrong? A. Hey Roxanne, I’m sorry to hear your granola burned! If you have an oven thermometer, I’d recommend checking to see how hot your oven is actually running. Sometimes ovens run hotter than the dials/digital displays would have you believe, and that can definitely result in a burned batch of granola. Also, I’m not sure if you’re using the convection oven setting, but the convection setting will cook things much, much faster. (As a rule of thumb, I never use my convection setting when testing recipes.) I’d suggest checking the oven temp and settings, baking it at a lower temperature, and keeping a close eye on it. Good luck! “OMG! 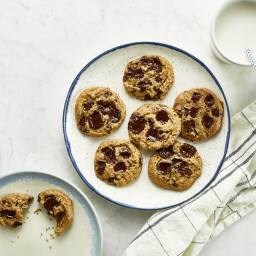 Just stopping by to say I made these One Bowl Chocolate Chunk Cookies the other night and was blown away! I’m a baker at heart but have taken a bit of a hiatus from it to focus on balancing my diet (more veggies, less brownies, etc.). After seeing this recipe and not being able to get it off my mind, I convinced myself they were practically a health food, so ok to take a shot at! I couldn’t summon enough patience for a trip to the store so decided to use what I had on hand. I ended up subbing corn starch for the arrowroot & just blitzed some almonds in the food processor for the almond flour. I used dark chocolate chips and got a little carried away with my subs and accidently added a flax egg too. I was worried I was going to be disappointed with the results but boy was I so pleasantly surprised! I’ve been raving about these cookies for two days and haven’t shared a one (maybe I’ll be more generous with the next batch!). Hey Kelley, It sounds like you hit the cookie jackpot!! Heh. Thanks for sharing your subs with us. I’ll have to try those out myself sometime, too. Also, I’m so happy to hear how much you’re enjoying the recipes. Thanks for the love! 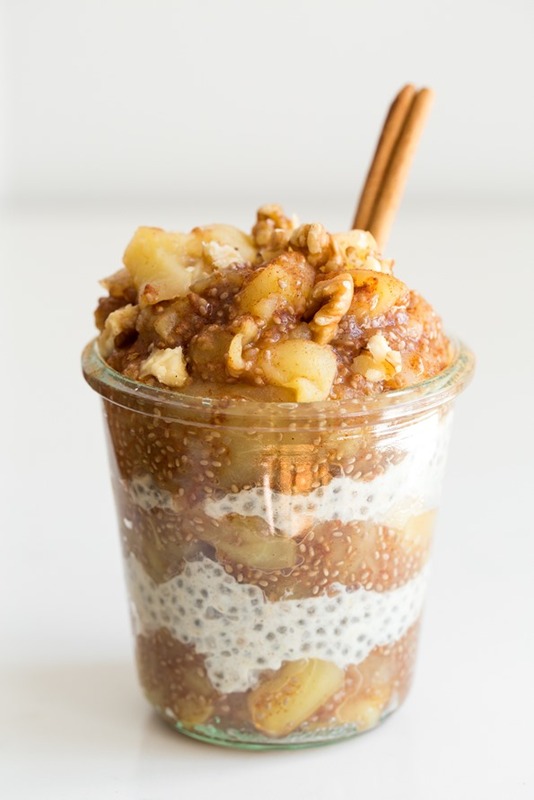 PS—The image at the top of this post is my Apple Pie Chia Jam Breakfast Parfait! My Bonus Recipe Bundle is here! Regarding the GLO Bars + sweetener question: I haven’t had any luck finding brown rice syrup in stores either, but I have found coconut syrup. It’s thick and rich-tasting and holds the Glo Bars together very nicely. I’d recommend trying coconut syrup if you can find it. I made the Sweet Potato Chickpea Curry recipe from your bonus recipe bundle and it was amazing! I’ve tried at least three other recipes for sweet potato chickpea curry and your is by far the best! Really looking forward to the cookbook launch! So glad to hear you’re loving it, Kate! Thanks Angela! Your tips are much appreciated. I started some of these things already and also changed the time to take the vitamin no earlier than noon and it has worked well. Maybe our bodies just have an adjustment period? I’m now actually eliminating better than I have in a while. :) Have a great weekend. So glad to hear it, Megan! Good thing to know about the difference between Tamari and Soy sauce! I try to avoid both but if I choose to buy one it’ll be Tamari. Hooray for Oh She Glows Everyday coming out 3 days earlier…in time now to make up some delicious new recipes for the long weekend ! Super hyped about freezer friendly recipes (hopefully family friendly too!!!) I’m always so happy when I got to the freezer and a meal is waiting for me. This is never more true than when I was sick. It’s so nice to be covered and not have to go out to eat for pricey and subpar food. Looking forward to Monday! Freezer-friendly recipes are the best! You can’t beat the convenience when life gets busy (or when an unexpected sickness strikes!). Hi! Regarding question three, I have some experience there! I’m very sensitive to iron supplements. When I became anemic during both of my pregnancies I used a pre-natal without iron and supplemented with Pur-Absorb iron. Its a liquid iron supplement and doesn’t have any screwy side effects (at least not in my experience). I really hope this helps Megan! Regarding the topic of Glo Bars and brown rice syrup – I haven’t had any luck finding brown rice syrup in my local stores either, but I have found coconut syrup. It’s thick so it binds the Glo Bars perfectly and has a lovely rich flavour. Hi Angela! Where should we direct our questions that we would love to have answered in your Friday FAQs? I found my brown rice syrup at Bulk Barn. Only place I could find that carried it. Thanks you so much and I can’t wait to see the next book!! Hi Hanna, thanks so much for the lovely words! :) Unfortunately, that pancake recipe isn’t quite ready to be shared on the blog just yet, but here are a few of the pancake recipes that I’ve posted in the past. Hopefully one of them is up your alley! I’ve always wanted to try coconut aminos–it sounds delicious! I also find that my digestion is so much better if I eat smaller, more frequent meals and if I eat my food more slowly and chew my food more thoroughly! Thank you for this post. I’ve got two little kids and meal planning has been an intense struggle. Your blog, books and recipes have been central to my focus on health and wellness. My freezer is already stocked with your Bean Balls and Spiced Red Lentil, Tomato, and Kale Soup. Keep up the amazing work. It is truly inspiring. Hi there, Thanks so much for the warm words. I’m so happy to hear that you and your family have been enjoying my recipes!